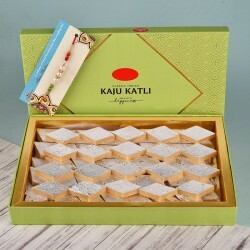 Celebrate this Raksha Bandhan with some Traditional sweets. 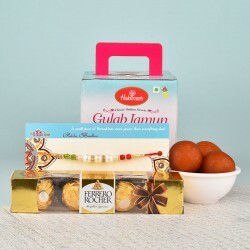 Surprise your Brother with a beautiful Rakhi and some delicious Sweets. Name any Sweet and we will get it packed for you. We have the best Sweets and Rakhi combos that are sure to make your Brother feel on top of the world. One of the sweetest relationships in this world is that of a Brother and a Sister. To highlight its beauty, we celebrate the festival of Raksha Bandhan. It signifies the unbreakable bond of a Brother and a Sister. The sweetness of this relationship can only be celebrated with some traditional sweets. A Sister ties a Rakhi on the wrists of her Brother while he promises to protect her and along with that, a lot of sweets, wishes and other gifts are given to each other. On this Raksha Bandhan, send beautiful rakhi with sweets to your Brothers with MyFlowerTree. Take a look at our collections and we are sure that you will be blown away by them. We challenge you to stop at just one because we know that you won't be able to keep your hands off these rakhi and sweet combos. Raksha Bandhan is an age old festival. It is a part of our rich tradition. Along with tying Rakhi on the wrist of a Brother, giving him some sweets is also an important part of the rituals. 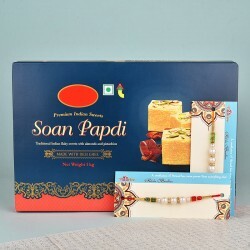 So, this year, take the traditional route and send rakhi with sweets to your Brother and make him happy. 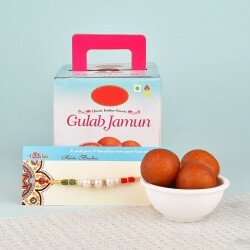 We have all-time favourite sweets like Gulab Jamun, Rasgulla, Rasberi, Gandheri, Kesari Petha, Kaju Katli, Soan Halwa and more just for the Brothers. You don't have to go anywhere to get these juicy delicacies. 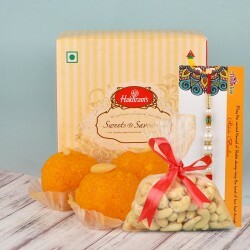 At MyFlowerTree, online rakhi and sweets are available for everyone. 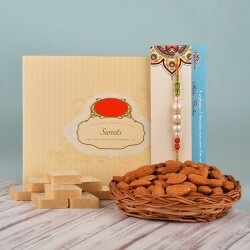 Not just the sweets, you can also surprise him with Dry Fruits. 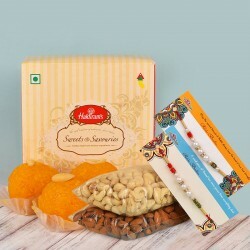 Wish your Brother with Rakhi and some amazing Dry Fruits on this Raksha Bandhan. We have special thalis of Almonds, Cashew nuts, Pistachios, Walnuts and Raisins and more. If you want to give a modern touch to your celebrations, you can rakhi with chocolates to your Brother instead of sweets. Our Chocolates Collection includes KitKat, Dairy Milk Fruit and Nuts, Temptations, 5 Star, Lindt, Ferrero Rocher, Dairy Milk Silk, Dairy Milk Oreo and more. We have many homemade Chocolates and Assorted chocolates as well. Other than Chocolates, Dry Fruits and Sweets, we have some other amazing gifts for the Raksha Bandhan as well. Take a look at our Collections of Flowers which includes beautiful and Fragrant Roses, carnations, Gerberas, Lilies, Orchids and Birds of Paradise. Our wide Cake collection has flavours like Black Forest, Chocolate, Strawberry, Pineapple, Mango, Chocolate Truffle, Ferrero Rocher, Coffee, Caramel, Coffee Caramel, Cheesecake, Kiwi, Fruits, Oreo and many more. Rakhi is the most important part of Raksha Bandhan and every sister wants to tie the best Rakhi on the wrists of her Brother. That is why we have some amazing rakhi for brother. Our collection of traditional Rakhis has some of the most preferred motifs of peacocks, elephants, flowers and many other idols of Gods and Goddesses. Our collection of Fancy Rakhi includes, Kundan Rakhi, Silver Rakhi, Pearl Rakhi, Rakhi Bracelets and more. 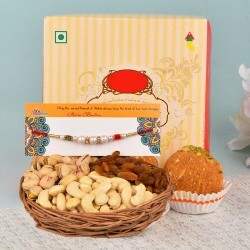 Now send Raksha Bandhan Rakhis and Sweets to your Brother without any delay. Don't wait for another day to come and order all the items online. Send rakhi to delhi, Bangalore, Chennai, Tamil Nadu, Mumbai, West Bengal, Rajasthan, Punjab, Haryana, Puducherry, Karnataka, Hyderabad, Chandigarh, Bihar, Jharkhand, Jaipur, Himachal Pradesh, Uttarakhand, Uttar Pradesh and more, our services are available for all the major and remote cities. We deliver internationally too and some of the major foreign countries where we deliver are Canada, Dubai, Australia, USA, France, Germany, Africa, Spain, Bangkok and more, our list is endless. Products in this category have been rated 4.8 out of 5 based on 147 reviews.